Some independant analysts believe NROL-27 will be a geostationary SDS satellite. The patches, especially the second one, tend to support that suspicion. 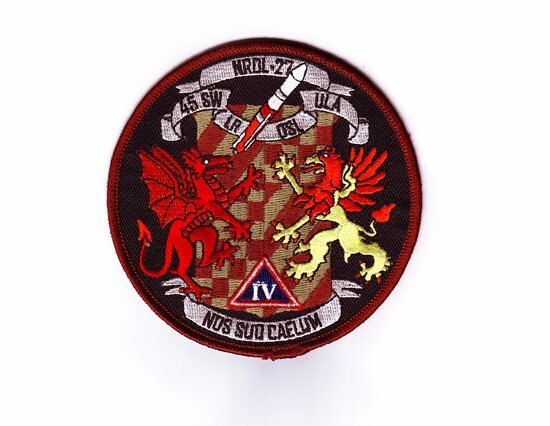 The Latin "Nos Suo Caelum" in the second patch means "We Connect the Heavens". This is exactly what SDS satellites do: they provide an uplink and downlink platform between other (reconnaissance) satellites and their operating centers. The red Dragon in the second patch, might indicate this new SDS will notably serve a role for SIGINT satellites (as historically, dragons in patches signify SIGINT satellites). The Gryphon, part lion, part eagle, features in both patches. Gryphons guard treasure and possessions, and are symbols of the divine and divine power; strength, military courage and leadership. The "Custos Divini" in the first patch means "Guardian of the Divine".